The PAS-60 is acknowledged as The most powerful Audiosonic Acoustic Cleaner available it has awesome long range power and is available in a four section format either straight or curved. 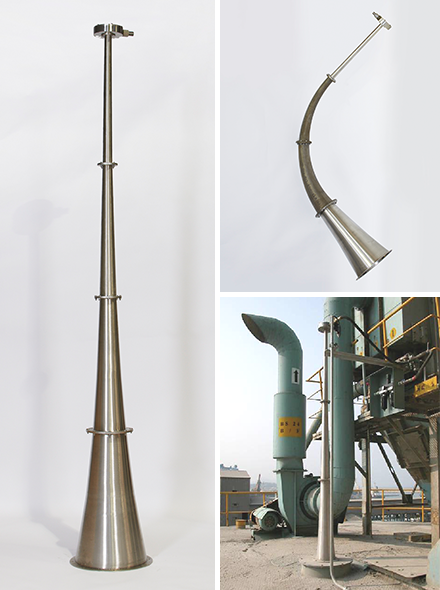 This unique sonic horn not only develops it's maximum power at the key 60 Hz frequency but also because of its unique design maintains that power level through a range of frequencies. Imagine having a 30,000 tonne capacity cement silo suffering from severe material sidewall build up. It's a big problem! However, an effective, economical means is now available to prevent this from occurring in the first place - the PAS-60 Acoustic Cleaner. What's more, no other company can offer this ultra-powerful sonic cleaner! With a PAS-60 installed on the top of the cement silo, sidewall build up and ratholing will be prevented from occurring in the first place and allow full use of the silo's capacity. The sheer material de-bonding power of the PAS-60 Acoustic cleaner can also be used within large Boiler, ESP and SCR systems. These two photographs are of 30,000 tonne cement silos in South Korea and India where varying climatic conditions - hot, cold and monsoon - caused massive material sidewall build up and ratholing.